Married Kelly … has one daughter: Khloe … attended U.E. Valles del Tuy High School … Instagram: @alfredo_1401 ... Is an avid fan of the Los Angeles Lakers and Shaquille O'Neal. Spent most of the season in Chicago's minor-league system but made his major-league debut with the White Sox in May ... Sox pitchers owned a 2.25 ERA (6 ER/24.0 IP) when he was behind the plate … threw out 33.3 percent (1-3) of attempted basestealers in his three games ... Had his contract purchased from Charlotte on 5/24, replacing Welington Castillo on the active roster ... Made his major-league debut as the starting catcher on 5/26 at Detroit … went 0-4 with three strikeouts ... Recorded his first major-league hit and RBI, a game-tying single, in the fifth inning off Brent Suter on 6/3 vs. Milwaukee ... Was optioned to the Knights on 6/4 and outrighted on 6/6 ... Combined to hit .244 (52-238) with eight doubles, two home runs and 17 RBI in 64 combined games between Class AA Birmingham and Class AAA Charlotte ... Opened the season with Charlotte and appeared in 32 games (31 starts) at catcher, throwing out 9-25 (36.0 percent) of attempted basestealers ... Recorded two three-hit games with the Knights on 4/11 vs. Norfolk and 6/9 vs. Lehigh Valley l Was transferred to Birmingham on 6/22 for the remainder of the 2018 season ... Appeared in 31 games with the Barons and improved his average to .298 (hit .193 with Charlotte) ... Batted .317/.349/.463 vs. right-handers, .351/.403/.526 on the road and .429/.462/.592 in July ... Threw out 36.4 percent (16-44) of attempted basestealers ... Registered three straight multihit efforts from 7/13-16, including four hits with three doubles and five RBI on 7/13 at Tennessee. Spent the entire season with Class AA Birmingham ... Threw out 41.0 percent (28-69) of attempted baserunners ... Was disabled list from 4/29-6/1 (fractured right index finger) and 7/5-21 (strained right biceps) ... Appeared in three games with Caracas of the VWL. Broke out while playing at three different levels in the Astros system: Double A Corpus Christi (32g), Class A Advanced Lancaster (27g), Class A Quad Cities (13g)...in his 72 games across the three clubs, batted .321 (80x249) with six doubles, two homers, 37 RBI and a .409 OBP...threw out 24-of-51 (47.1%) runners attempting to steal...began the year at Quad Cities, where he hit .326 (14x43) with one double, one triple and a .482 on-base percentage in 13 games...hit in 10 of his 13 contests while throwing out 63.0% of runners attempting to steal (10-for-16)...moved up to Lancaster on May 7 and went on to hit .340 (36x106) with two homers, 15 RBI and a .388 OBP in 27 games...hit two homers on May 31 at High Desert...finished up his time with the JetHawks on an eight-game hitting streak (.419, 13x31)...promoted to Corpus Christi on June 30...hit .300 (30x100) with two doubles, 12 RBI and a .395 OBP in 32 games with the club...made his pitching debut on Aug. 9 vs. Midland, facing two batters (hit batter, strikeout). Spent the year at Rookie Level Greeneville, batting .240 (25x104) with four doubles, two homers, 10 RBI and a .342 on-base percentage... threw out 41.7% of runners attempting to steal (10-of-24). Returned to the GCL Astros for his second season, playing in 27 games...hit .244 (22x90) with a .299 OBP...caught 10-of-17 runners attempting to steal (37.0%). Played in 30 games in the GCL, batting .172 (16x93). Missed the season due to injury. Played in 31 games in his professional debut with the DSL Astros, batting .167 (15x90). 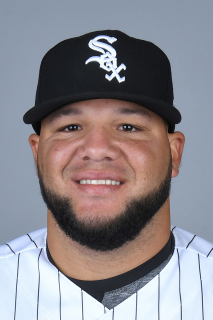 January 22, 2019 Chicago White Sox invited non-roster C Alfredo Gonzalez to spring training. June 22, 2018 C Alfredo Gonzalez assigned to Birmingham Barons from Charlotte Knights. June 6, 2018 Chicago White Sox sent C Alfredo Gonzalez outright to Charlotte Knights. June 4, 2018 Chicago White Sox optioned C Alfredo Gonzalez to Charlotte Knights. May 24, 2018 Chicago White Sox selected the contract of Alfredo Gonzalez from Charlotte Knights. April 5, 2018 C Alfredo Gonzalez assigned to Charlotte Knights from Birmingham Barons. January 22, 2018 Chicago White Sox invited non-roster C Alfredo Gonzalez to spring training. December 6, 2017 C Alfredo Gonzalez assigned to Leones del Caracas. September 17, 2017 Chicago White Sox sent Alfredo Gonzalez outright to Birmingham Barons. July 12, 2017 Birmingham Barons activated C Alfredo Gonzalez from the 7-day disabled list. July 5, 2017 Birmingham Barons placed C Alfredo Gonzalez on the 7-day disabled list. June 1, 2017 Birmingham Barons activated C Alfredo Gonzalez from the 7-day disabled list. May 4, 2017 Birmingham Barons placed C Alfredo Gonzalez on the 7-day disabled list. April 6, 2017 C Alfredo Gonzalez assigned to Birmingham Barons from Charlotte Knights. March 15, 2017 Chicago White Sox optioned C Alfredo Gonzalez to Charlotte Knights. October 3, 2016 Chicago White Sox recalled Alfredo Gonzalez from Charlotte Knights. October 2, 2016 C Alfredo Gonzalez assigned to Leones del Caracas. September 1, 2016 C Alfredo Gonzalez assigned to Charlotte Knights from Birmingham Barons. July 2, 2016 Houston Astros traded C Alfredo Gonzalez to Chicago White Sox for cash. July 2, 2016 Chicago White Sox optioned C Alfredo Gonzalez to Birmingham Barons. June 25, 2016 Houston Astros designated C Alfredo Gonzalez for assignment. March 17, 2016 Houston Astros optioned C Alfredo Gonzalez to Corpus Christi Hooks. November 20, 2015 Houston Astros selected the contract of Alfredo Gonzalez from Corpus Christi Hooks. June 30, 2015 C Alfredo Gonzalez assigned to Corpus Christi Hooks from Lancaster JetHawks. May 7, 2015 C Alfredo Gonzalez assigned to Lancaster JetHawks from Quad Cities River Bandits. April 1, 2015 C Alfredo Gonzalez assigned to Quad Cities River Bandits from Tri-City ValleyCats. June 13, 2014 C Alfredo Gonzalez assigned to Tri-City ValleyCats from Greeneville Astros. June 17, 2013 C Alfredo Gonzalez assigned to Greeneville Astros from GCL Astros. September 21, 2010 Alfredo Gonzalez roster status changed by GCL Astros. July 30, 2010 GCL Astros placed C Alfredo Gonzalez on the 60-day disabled list. June 16, 2010 DSL Astros sent C Alfredo Gonzalez on a rehab assignment to GCL Astros. May 28, 2010 DSL Astros placed Alfredo Gonzalez on the reserve list. May 19, 2009 DSL Astros signed free agent C Alfredo Gonzalez.